This entry was posted in Uncategorized on July 30, 2015 by TPNadmin. Los Angeles – After a short vacation, Dava Foxx is back in LA and she’s excited to bring her fans even more jaw dropping scenes. Sham compliance or sincere effort? 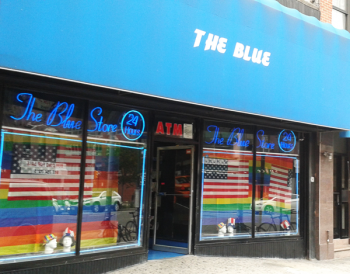 The Blue Store (Eighth Ave. btw. 20th & 21st Sts.) has consistently toned down the nature of its window displays. Photo by Scott Stiffler.